Please note though that Exhibit B is *not* applicable if the parties choose to use a Stipulated Sum. The A141 - 2004 with its attached exhibit makes up the core of the Design-Build Contract. And because the A141 - 2004 includes its own Terms and Conditions it does not require use of the A201 - 1997. Exhibit E, Insurance and Bonds. Unlike the B491 – 1996 document, the A142 – 2004 does not rely on A201 for its general conditions of the contract. 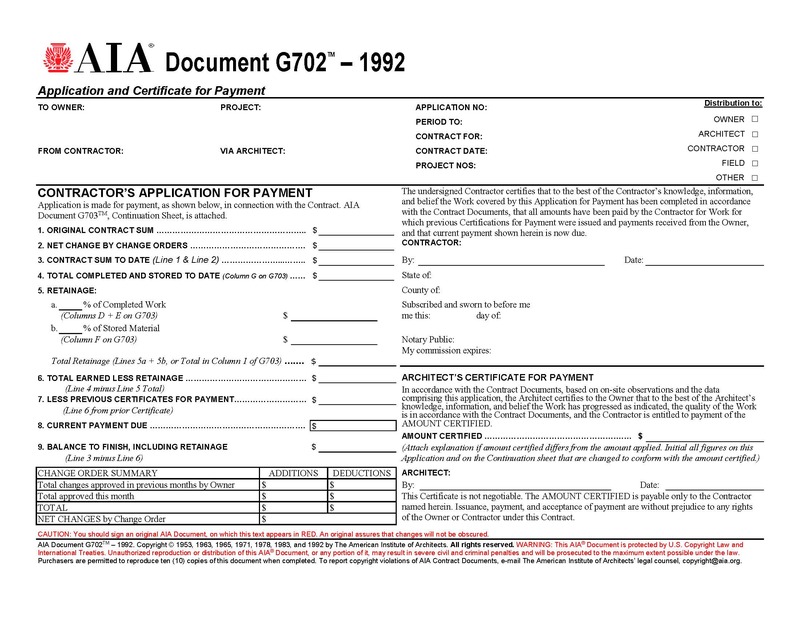 I've been told over the years that the AIA documents are always skewed in the Architect's favor. They're not the ideal documents for every project; please get the help of an attorney before agreeing to the use of any document that the contractor provides to you. Downloadable, fill-in-able PDF version of the G702/G703? Click here!